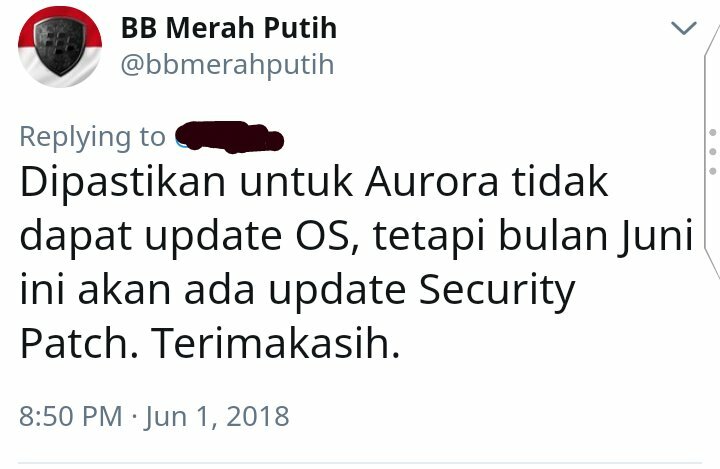 Just in case not all members are familiar with Bahasa Indonesia, the jist of the message is that there is no further OS updates for the BlackBerry Aurora, but there will be the June security patch. so that will the last patch and the last device I bought from them. I have 2 aurora devices and was willing to buy a new one. lucky for me I bought the Keyone in the UK. Strange thing they still promote te device along the keyone. So not upgrading the os is weird because it is a great device and potential with oreo it is a steal to buy it. I suspect they would have to raise price significantly for OS upgrade. Maybe this was planned all along, maybe the ZTE thing (yes this is a ZTE with BlackBerry paint on top) accelerated this, who knows. what I also think they will roll out a new device because they asked what of camera people like to see on a device. so maybe it had the same fate like dtek series. Not surprised given their track record. But it's funny that Aurora was the first BlackBerry Android to run Nougat but they're still abandoning it so soon. it probably barely sold any units anyway though so I doubt many people are upset. The KEY2 has an Indonesian variant in the OS, that might be their next phone. has anyone received a security patch? I still have not received a security patch, and now it's July. New ota update for priv has an app labeled DOC in blue, won't stay closed. I can't use device.